Mix lime juice, cumin, salt and garlic in shallow glass or plastic dish. Stir in pork. Cover and refrigerate, stirring occasionally, at least 15 minutes but no longer than 24 hours. Remove pork from marinade; reserve marinade. Spray 10-inch skillet with cooking spray; heat over medium-high heat. Cook pork in skillet 3 minutes, stirring once. Stir in onion, bell peppers and marinade. Cook 5 to 8 minutes, stirring occasionally, until onion and peppers are crisp-tender. Place one-fourth of the pork mixture on center of each tortilla. Fold one end of tortilla up about 1 inch over pork mixture; fold right and left sides over folded end, overlapping. Fold remaining end down. You can use 1/2 pound boneless skinless chicken breasts instead of the pork. Serve these fast fajitas with a mixture of chopped tomato, chopped fresh cilantro, salsa and sour cream or yogurt. 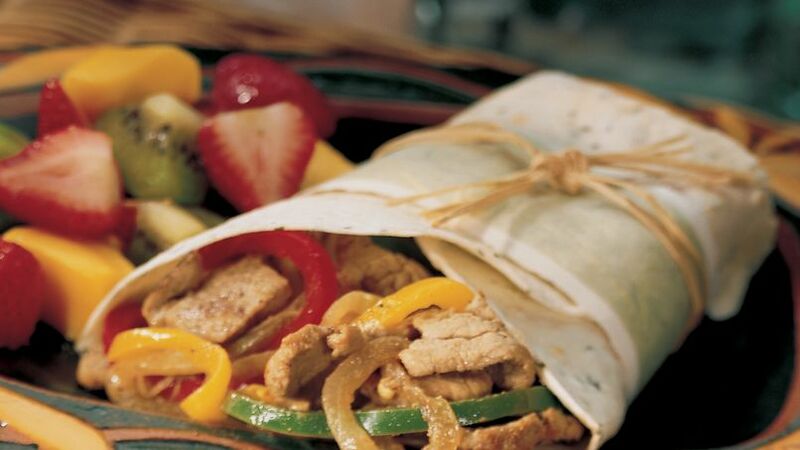 Lime juice, cumin, onion and bell pepper wrap up a bundle of great flavor in these no-fuss "fajita-wiches".